We have built a series of "thrusters", Transform or Physics components that changes game objects position or rotation, can be used as thrusters, engines, controllers, hammers, wind etc. 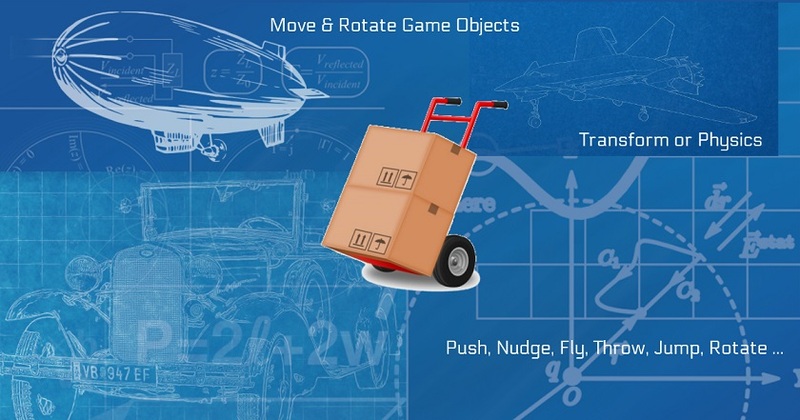 BPropulsionSystem is composed of a series of Unity3D components designed for MVPs or prototypes that involve moving parts (game objects, characters, enemies, cars, leaves, magnets and so on). It is a "system" because we have pre-built helper components that will speed your development time, like: throttle controllers with keyboard or joysticks, special effects (particles, lights and sounds) and more. 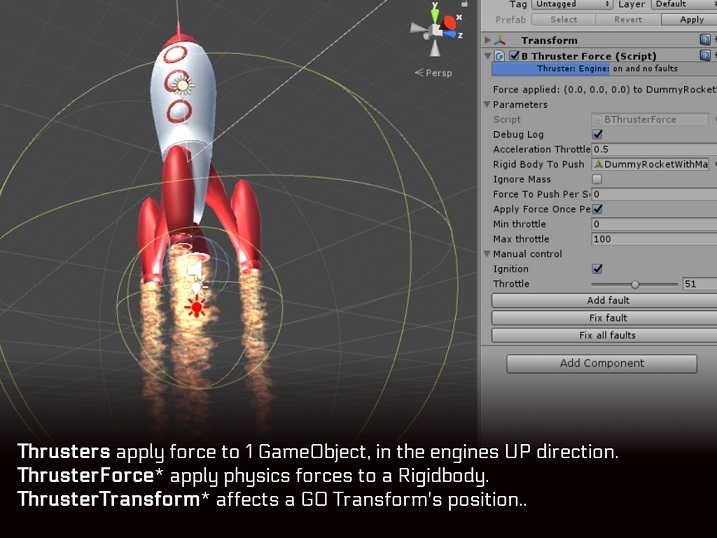 continuous force applied: car, spaceship, boat, submarine, wind, character jump etc. one time push/nudge: canon ball, pinball etc. designed to be extended - the logic is split to multiple functions so you can extend our classes and implement your own custom components, optimized for your specific needs. Force - add a Force to a rigid body for each frame (or physics tick), used for simple physics. Force Point - add a Force and Torque to a rigid body, used for realistic physics, it's position and rotation directly affects the force. Applied Collider - add a Force to another Rigidbody, push/pull (attract or repel), used for simple magnet/gravity. Transform Move - increase a Transform position. Transform Rotate - increase a Transform rotation based on it's rotation. 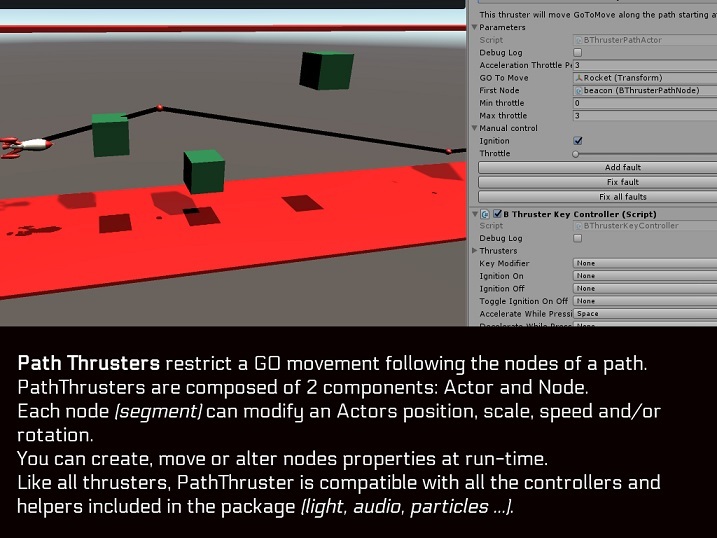 Path Actor - moves a Transform position along a predefined linear path made by multiple nodes. 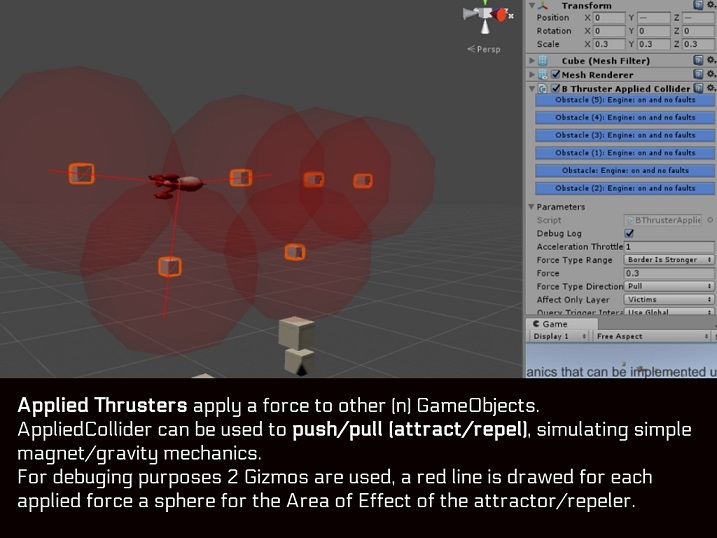 Helpers are optional components that are used to affect, interact, display the thruster effects or connect them to other components (made by other devs or Unity). 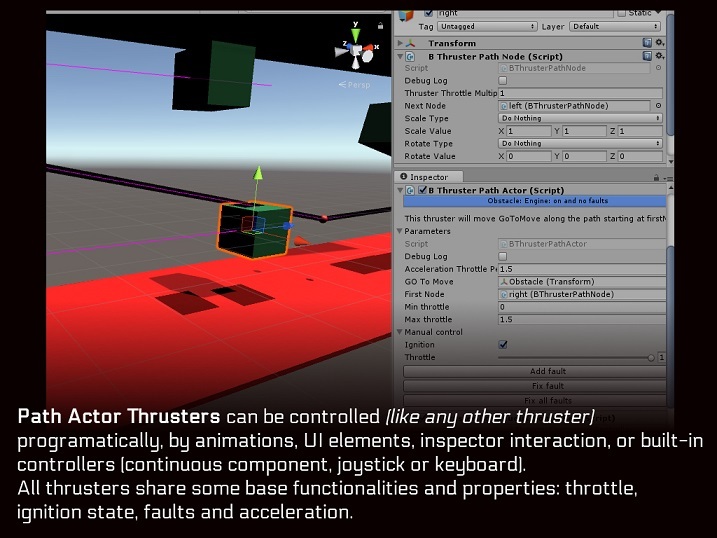 Most of them work with all types of thrusters, and they were built for demo purposes, as an example of how simple but powerful the Trusters can be. 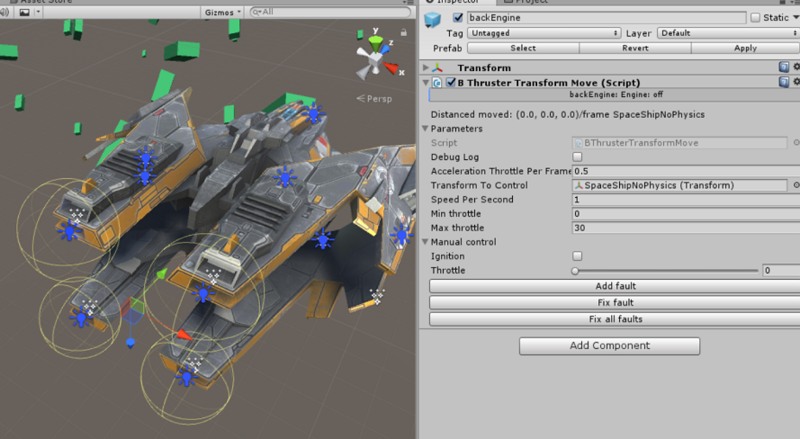 Together with the Thrusters and Editor components form the BPropulsionSystem. Key - binds a Keyboard/Controller key event to actions: Ignition (on, off, toggle), throttle (accelerate, decelerate, to minimum, to maximum). Hover - automatically accelerate/deccelerate based on collider's raycast collisions. Multiple sensors can be created to scan for collisions. Light - link a thruster to 1 or multiple Light component. Based on throttle it can automatically control the Intensity, Range and/or Color (gradient). Particles - link a thruster to 1 or multiple ParticleSystem components. Based on throttle it can control the StartLifeTime, StartSpeed and/or Emission RateOverTime. Sound - link a thruster to 1 or multiple AudioSource components. Based on throttle it can control the Volume and/or Pitch. PathLineDraw - populate a Unity.LineRenderer with a PathActor next nodes. You can combine any controller or helper with any thruster! All the components have a DebugLog flag, when turned on it displays in the console relevant messages. Example the debug flag on a controller will throw a message each time a key press is detected and the action was made. Use relevant gameobjects naming as they will be displayed in the debug messages. 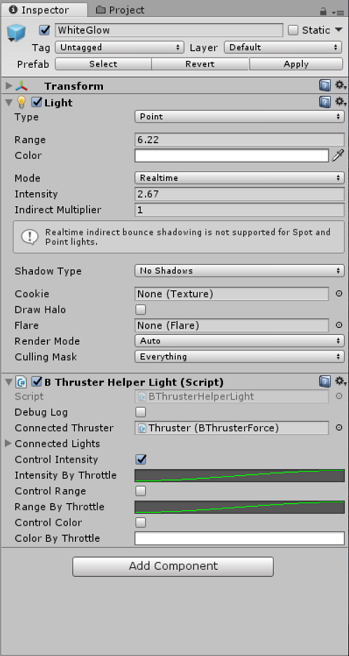 Example: attach the Controller component to a "ControlThrusterLeft" game object so you will know from which controller the debug came from. Why is the package so large (6mb)? The scripts size is 100kb, the rest are the assets for the DEMO scenes, you can remove them at any time. You do NOT require the subfolders "Demo" and "Identity". What platforms are supported? Should work on any platform, contact me to solve any possible issues. 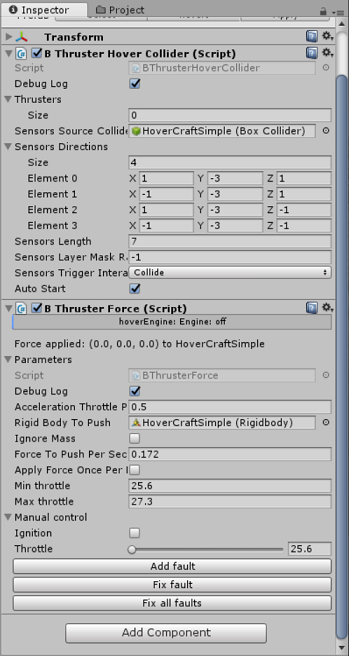 Can I control the Thrusters with DoTween, iTween, my own scripts, etc.? 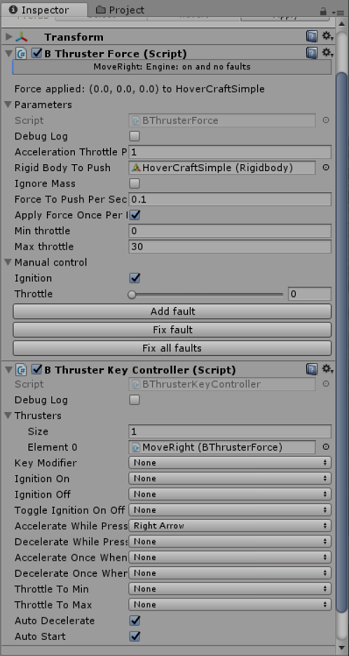 Yes, you will need the Controllers.BThrusterPropertyRelay component to directly control the thrusters' properties and states. Can I use multiple controllers for 1 thruster? Key vs joysticks Yes but you have to be careful, they will most likely cause problems/conflicts, same as having 2 bosses and 1 employee. You should have at most 1 controller that auto decelerates. First release. Includes 4 types of Thrusters (2 physics based), 4 controllers and 5 Helper components for extra functions. NEW BThrusterContinuousController - a new controller for continuous movement mechanics like Flappy Birds.